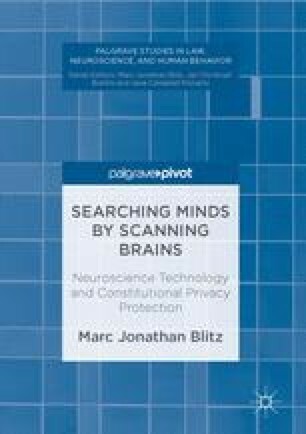 The questions raised of Fourth Amendment law by neuroimaging at first seem to have simple answers: The Fourth Amendment covers neuroimaging because probing any part of the body’s interior is a “search.” The standard level of protection against such a search is the warrant requirement, imposing on government the responsibility of showing probable cause and specifying the place to be searched before conducting such a search. However, matters are not so simple. There is significant gray area in the Fourth Amendment that the court has used to give government flexibility in meeting vital security interests. This chapter shows that some of the answers to these Fourth Amendment problems may unexpectedly have First Amendment solutions.